At the time of the last general election I decided to support the Lib Dems and actively campaigned for them, delivering leaflets and trying to convince people. After the election although I had significant mis-givings with the coalition with the Conservatives I continued to support the party even standing as a candidate in the May 2011 District Council elections. My first major disappointment was with student tuition fees. 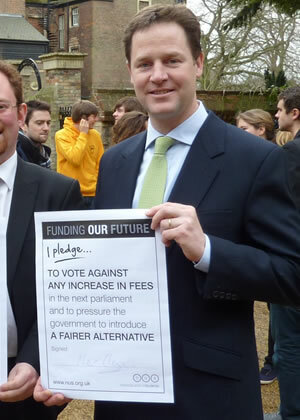 After signing a pledge to vote against any increase in tuition fees you agreed to treble them. What was worse is that thousands of young people became disillusioned with politics having voted for you and being betrayed. But it what you are allowing to happen with schools that has finally made me decide to leave the party. The Conservatives advance the "big society" as their big idea this election but it looks more like a smokescreen for cuts to public services. They claim these cuts will spare "front line" services but can we trust a party who when last in power left a country with disintegrating pubic services from railways to schools with holes in the roof? There need to be cuts to public spending that much is clear but the Conservative party cannot be trusted to deliver them. Their policies on schools show their true colours. At a time when what is needed is an assurance that school budgets will be protected they are offering to set up new "free schools" to take money away from existing local schools. We simply cannot afford to do this even if it was a good idea and the fact that they are proposing them shows that they are putting ideology before service delivery. All this has happened and worse. Last week the Department for Education approved a contract to allow a profit making Swedish company to run a new free school in Brandon, Suffolk. I have had to sit and watch the complete disaster that the coalition's education policies have caused in my home county of Suffolk. I have written about this in my blog. I accept that a collation means that there need to be compromises. But these should be on both sides. I did not vote for your party in the expectation that you would stand by and allow the Tories to privatise our schools or indeed our hospitals. There are many good people in the Lib Dems but I regret that I cannot in good conscience continue as a member. The upcoming commons vote on the benefits cap is testament to the sorry state of affairs that British politics has become with the three main parties advancing similar policies with little real choice between them. No wonder that so many people have given up voting all together.